ATHLETES and organisers are looking forward to the biggest-ever Chichester Triathlon Series this weekend (July 4/5). Now in its ninth year, the event has grown to become one of the largest pool-based triathlon competitions in the country. More than 600 adults and children will be taking part across two days, including a record number of 36 teams. Chichester Westgate Triathlon Club (CWTC) will be aiming to defend their titles in the male and female Olympic-distance events but will face competition in triathlon clubs from across the south-east. Younger athletes will be taking part in the junior aquathlon on Saturday. 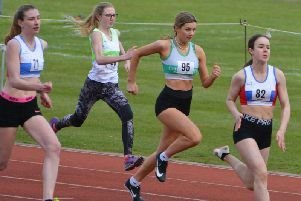 It’s for eight to 16-year-olds and will start at 1pm with a swimming race at Westgate Leisure, followed by a run around Chichester College’s campus. On Sunday, adults take part in Olympic and sprint-distance events, with the earliest starters setting off at 7am. The Olympic-distance event consists of a 600m pool swim at Westgate Leisure, a 42km bike ride, which includes cycling up South Harting Hill, and a 10km run along Centurion Way. Teams from Chichester District Council and event sponsors Natures Way Foods will be among the entrants. There will also be a shorter race, known as a try-a-tri event. Sarah Baldock, director responsible for Natures Way Foods’ community programme, said: “On behalf of everyone at Natures Way Foods, I’d like to say good luck to everyone taking part in the aquathlon, try a tri and triathlon events this weekend. On Saturday, prizes are expected to be handed out at 3.30pm. Sunday’s prizegiving ceremonies are expected at 12.30pm and 3pm. See the Observer next week for full coverage.